Wander eco-cafe is on a mission to educate people about sustainability. Left to right: Glen Kranenburg and founder, Taryn Shirkey. One of our own is changing the way Aucklander’s think about sustainability. 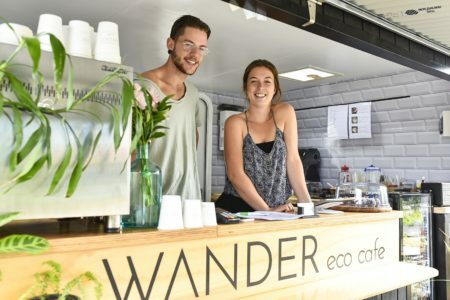 Pakuranga resident, Taryn Shirkey, is the founder of the new Auckland pop-up cafe, Wander Eco-Cafe, which opened its doors to the public in March. Based out of a renovated trailer in Wynyard Quarter, Wander Eco-cafe prides itself on using fully compostable packaging, mostly organic ingredients and offering fresh baked wholesome foods that come directly from owner to customer. “Our goal is to spark a little bit of consciousness around the way people consume everything, from food to packaging,” says the 22-year-old business owner. “There are so many people who are ignorant about sustainability and the benefits of using organic products. It’s about using things that are safe for the environment, that reduce waste and are good for us,” she says. Shirkey hopes to encourage people to consume sustainably by making it easier for them to create less waste. “We run a promotion where if you buy eight coffees you get your ninth free. However, if you bring your own cup, it counts as two coffees and you get two stamps. It’s a little incentive for people to use their own cups. “We also sell our own ‘Keep Cups’ that are reusable and people are quick to say, “I don’t want to spend money on that cup. And I always say, ‘its okay, you don’t have to buy our cup, bring your mug from work’. For me this isn’t a marketing thing for my cups, it’s about the environment,” she says. Although Shirkey and her team are doing their part by providing packaging that comes from the plants, she says the biggest challenge is people don’t realise that buying compostable packaging is only the first step. “We try really hard to let people know that if they throw their compostable cups in the rubbish, it doesn’t actually get composted, but there are a lot of people who are so stuck in their ways that they don’t listen,” she says. The entrepreneur is determined not to give up. As well as having a compost bin available beside Wander and encouraging people to only throw the packaging away in compostable bins, she is working alongside business surrounding Wynyard Quarter to provide compost bins in their offices. She says if you had asked her two years ago if she would have her own cafe today, she would have laughed. Shirkey came up with the idea for an eco-cafe with her friend Sophie Elliot while they were both studying marine science at Auckland University and says people are constantly surprised at her career change. “I hate how we are all forced to just have one dream. I have a million dreams, and I love a million things and I want to do all of them in my lifetime,” she says. Shirkey says that she can’t wait to come back to her marine biology career one day, but for now she believes Wander Eco-Cafe is her mission.